With US President Donald Trump pushing for Israeli-Palestinian peace progress, Israel’s Prime Minister Benjamin Netanyahu is again looking to widen his coalition by bringing in politicians from the center left, a TV report said. The report coincided with a new poll showing more Israelis backing than opposing a 2-state solution based on the pre-1967 lines. The report, on Israel’s Channel 2 news on Friday night, said that Netanyahu and opposition leader Isaac Herzog spoke by phone on the eve of Trump’s visit to Israel this week, and have arranged to meet in the aftermath of Trump’s trip. Herzog, who met with Trump briefly on Tuesday, has said repeatedly in the last few days that he would back Netanyahu — from outside the coalition — were the prime minister to push for substantive progress in peacemaking with the Palestinians. Netanyahu is working to broaden his coalition because he wants room for maneuver should direct Israeli-Palestinian talks resume, said the TV report, which was not confirmed. The same TV station on Friday night also published a survey showing Israelis backing a two-state accord deal with the Palestinians, based on the 1967 borders adjusted to include the major settlement blocs, by 47% to 39%, with 14% undecided. The survey also showed Netanyahu backed by 35% as their choice for prime minister, far ahead of centrist Yesh Atid leader Yair Lapid on 14%, with no other candidate in double figures. It also gave the Likud a healthy lead in Knesset seats, on 30, compared to Yesh Atid on 22, an improvement for the Likud on previous polls. 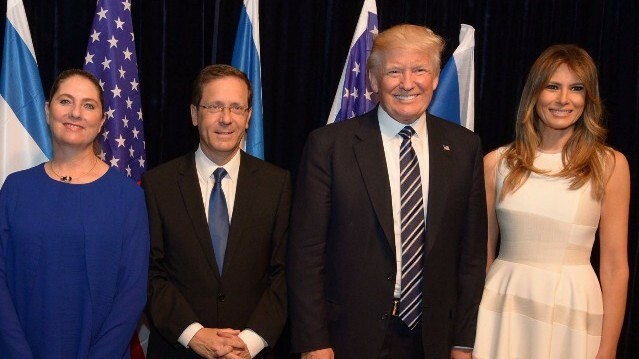 (R-L) US First Lady Melania Trump, US President Donald Trump, opposition leader Isaac Herzog and his wife Michal Herzog at the Israel Museum, Jerusalem. Herzog, head of the center-left Zionist Union came close to joining the coalition last year, but their negotiations collapsed amid mutual recriminations, and Avigdor Liberman’s right-wing Yisrael Beytenu party joined the government instead, with Liberman becoming defense minister. Herzog was set to join the coalition to advance peace talks, following a February 2016 summit, attended by Netanyahu, secretary of state John Kerry, Jordan’s King Abdullah and Egypt’s President Abdel-Fattah el-Sissi, which was intended to jump-start negotiating efforts. Herzog later blamed Netanyahu for spurning the opportunity under pressure from Likud and Jewish Home right-wingers. White House senior advisor Jared Kushner (L) watches as US President Donald Trump visits the Western Wall in Jerusalem’s Old City on May 22, 2017. enior ministers were quoted in the Channel 2 report saying that it was clear that Trump will be pressing Israel for compromise, and that celebrations on the right because Trump did not refer to Palestinian statehood during his visit, and did not criticize the settlement enterprise, were misplaced. “We’re all dancing on the Titanic,” an unnamed top minister was quoted as saying. The Channel 2 report quoted Israeli ministers who met with Trump and his team saying that the US president and his key advisers drew three conclusions about peacemaking from their trip: That progress on the Israel-Palestinian front is central to progress elsewhere in the Middle East; that Abbas, with whom he has now met twice, is a viable partner; and that the notion that Netanyahu can’t make compromises because of the constraints of his right-wing coalition is false, since the center-left would support him. Bringing the Zionist Union into the coalition would be extremely complicated — because of opposition from existing coalition partners and from many in Herzog’s party. Furthermore, Zionist Union is holding leadership elections on July 4, and Herzog faces a serious threat to his hold on the party. 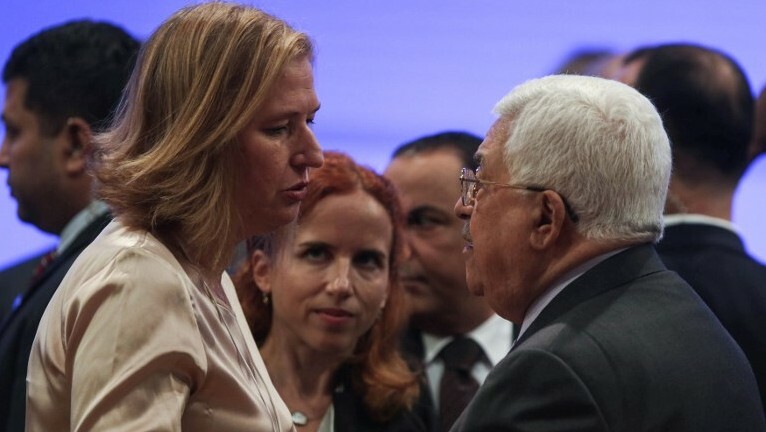 Zionist Union MK Tzipi Livni (L) speaks with Palestinian Authority President Mahmoud Abbas during the opening session of the World Economic Forum held in the Dead Sea resort of Shuneh in Jordan on May 20, 2017. Channel 2 suggested that Tzipi Livni, the former foreign minister who heads a 5-member faction (Hatnua) inside the Zionist Union, could break away from Herzog and join Netanyahu, but noted that Livni is skeptical about Netanyahu’s readiness to move forward. Livni, who shares the sense that there is an opportunity for a breakthrough, is said to have established a good relationship with Greenblatt. 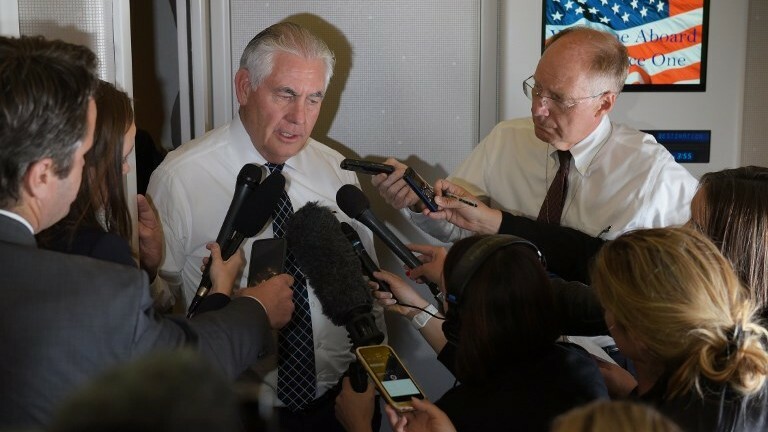 US Secretary of State Rex Tillerson speaks to reporters aboard Air force One shortly before arriving in Brussels on May 24, 2017. Tillerson further said that Trump “very forceful” pushing both sides that a peace deal will require them to make difficult compromises. “The president was very forceful in his encouragement to both of them to be serious about approaching these discussions in the future and recognize they have to compromise; everyone has to compromise,” he said. America’s top diplomat also suggested that Israeli-Palestinian peace could be a catalyst to greater regional peace, what is sometimes referred to as the linkage argument. Trump “has made the point several times: We solve the Israeli-Palestinian peace dilemma, we start solving a lot of the peace throughout the Middle East region,” Tillerson said.